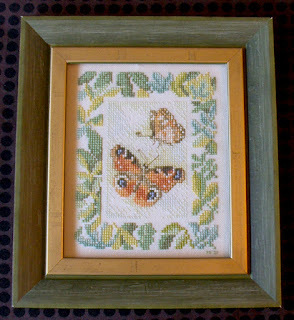 Mary Corbet has been waxing philosophical about the purpose of hand embroidery over the past couple of days, and I have been in a philosophical frame of mind too, although in a slightly different direction. 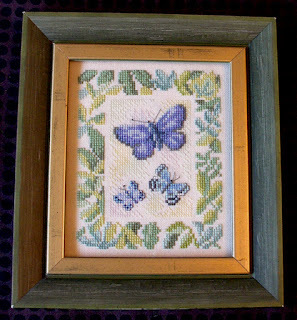 My position is that the main reason to do anything, and especially a hobby like handwork, is for the joy of doing it. The final product is completely secondary. I think the value of the project is largely used up by the time it is done. So it is no surprise that I am not a great finisher of projects! 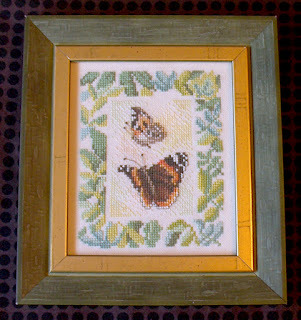 Anyone who has been stitching for a while knows the challenge of figuring out what to do with all! So I have been wondering recently what the benefit of finishing a project might be. Many of you are probably laughing because it seems self-evident. But for me, there is a lot more life in the potential of a project than in the finished product. "Around this time of year, students graduate from colleges and universities. It is significant that the ceremony marking the completion of their studies is called commencement. All that they have worked for and looked forward to completing becomes not an end, but a beginning.So it is in my life. Every time I achieve a goal, I find myself at a place of beginning as well as completion. Before a new chapter has a chance to unfold, I may feel I’ve come to a standstill. Yet as soon as I realize I am ready for something more, a new door opens." So I think I'm beginning to realize that a finished project is as much a beginning as an ending, which let me tell you, is a much better feeling thought for me! 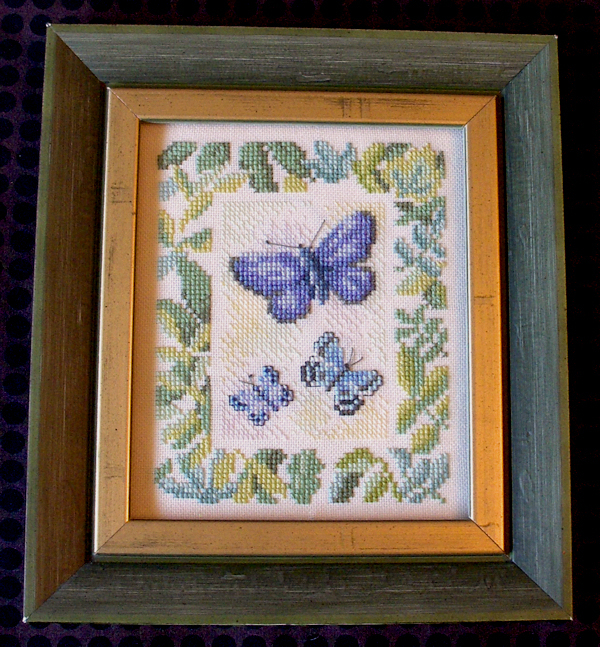 These three butterfly pictures were cross stitch kits from Lanarte a little over ten years ago. Fortunately, I still like them! I love your take on the value of a project being largely used up in the doing of it. I feel the same way, but was not able to articulate it as well as you have. Thanks, Mary Ellen! I think a lot of stitchers feel that way. I also think that people who put themselves in knots trying to put a financial value on a finished product have completely missed the boat! I agree there is huge value in the doing - it is such joy and pleasure. I also like the anticipation of doing - ten years of pleasure in looking at them and anticipating stitching them. 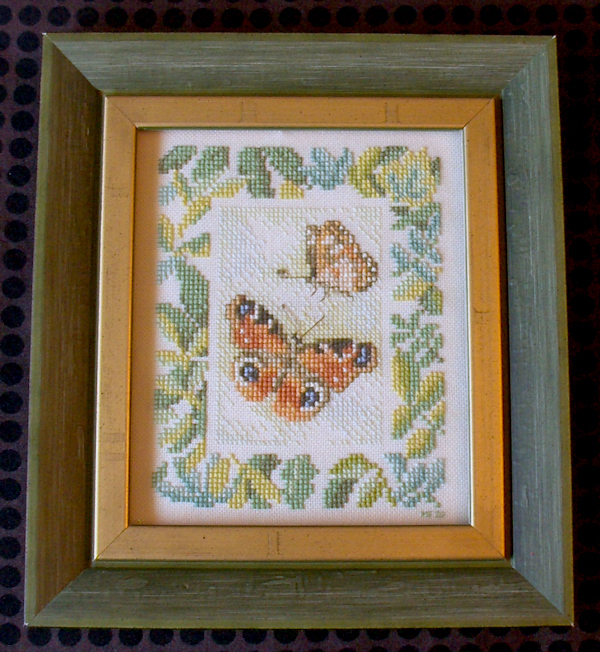 I think for me, the value of the finished product is in the remembered pleasure and satisfaction of having done it. Thanks for expressing so clearly the value of doing. It made me think about it differently. Thanks, Jillian, I'm glad it resonated with you. It's something I've thought about a lot!